"Want to go to the cottage?" One phrase, six words, and the ability to transport the listener to a whole other reality. Come summertime, there is no sweeter sound to my ears than the promise of a leisurely weekend of food, friends and family, and the opportunity to let concerns of the every day fall away. While the fall may almost be upon us in the Northern Hemisphere, there still is a part of me that is thinking about the summer sun and afternoons on a deck somewhere. Inspiration for the menu would not be hard, with Marty's World Famous Cookbook (Whitecap Books, 2008) nearby. This cookbook offers up the sort of crowd-pleasing fare that is made for a long weekend of relaxation. And it is not surprising, considering the fact that the author, Marty Curtis, owns and operates the highly-popular Marty's World Famous Café in Bracebridge (located in the Muskoka Lakes region of Ontario, a popular cottage destination). The book features many of the café's specialties; included are the recipes for their chicken stock and house bread, with notes brewing the perfect cup of coffee. If pressed to find an adjective for this book and its author, I would have to say "likeable." The food is casual, the sort that inspires guests to roll up their sleeves, put their elbows on the table and dive in. Few of the recipes would be considered daunting or demanding of the home cook and the writing is conversational and welcoming. Curtis' enthusiasm for his food is evident in the anecdotes and tips that are scattered heavily through the pages, often accompanied by evocative location photographs by Allen Dew. The subjects are far-ranging, reminiscent of the wandering conversations of a long weekend. He covers everything from the importance of mental preparedness in the kitchen to the parable of stone soup to how to improve at fishing. By his own admission, Curtis believes it is best to "go big" - serving up generous 14" pies, jumbo pastries, and showcasing bold flavours at every turn. It is apparent that Mr. Curtis is a man of specific tastes, with an evident love of citrus and aromatic spices. Most notable though is Curtis' preference for the mix of salty and sweet; the combination appears in many recipes with varying success. To that end, this book seems stranded in a middle ground of being simply nice. The indulgent breakfast and desserts were standouts, but I found many of the main dishes fell short of expectations. The enormous Lemon, Blueberry and Cream Cheese muffins were tender and moist. With a good deal of sharp lemon to balance the richness of the cheese, these showcased the blueberries quite well; most likely the perfect breakfast for any fan of cheesecake. 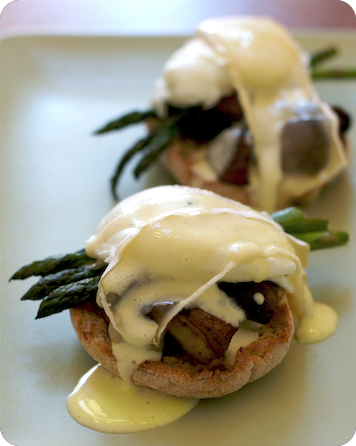 Eggs Benedict are made even more unctuous through the addition of brie - blitzed momentarily under the broiler, the cheese melts lusciously over the eggs and asparagus. Once napped with Hollondaise, the dish was good but overly-rich to my palate. To that end, I chose to add a splash more acid and a tablespoon of hot water to thin the sauce. Lovers of indulgence might not feel the need to make such alterations. Marty's Best Brownies were another winner. The rich batter bakes up dense and fudgy, with a deeply crackled top. Walnuts, freshly-roasted and sprinkled with kosher salt, are a tasty addition. The nuts are buttery but with saline crunch that adds punctuation to the sweetness of the dessert. I would be remiss to review this book without mentioning Marty's World Famous Buttertarts. They are an evident passion; gracing the cover in their golden glory, garnering 16 pages of photographs, notes and recipes within. Not only are they one of the main draws to the café, but they also seem to be the embodiment of Curtis' food philosophy - they are unapologetically large, sweet with warm spices and featuring a hit of citrus. Although I have never been to Mr. Curtis' shop, I had to try these at home. The lard-based pastry (which is also used for sweet and savoury pies) came together quickly, was easy to work with and produced wonderfully-flaky results. While everyone loved the pastry, the buttertarts as a whole received mixed reviews. Some found the filling unlike their opinion of the archetypal treat and so were disappointed, while others found these to be a welcome departure from heavier versions. I think buttertarts, like the perfect apple pie, are deeply rooted in personal preference and so the idea of tacking down a universally-loved ultimate recipe is virtually impossible. From the Fishin' Muskoka section, the BBQ Wine and Herb Salmon was succulent and moist, however the highly-flavoured marinade (while delicious) verged upon overpowering the the fish iteself. The same could be said of the Candied BBQ Asparagus from Barbecue Classics. The tangy-sweet sauce contains both sugar and balsamic vinegar; a tasty combination but one that overshadows the asparagus flavour. As one tester put it, "this is really good, but it isn't about the asparagus." The Barbecue Classics section is also home to the intriguing idea of Buttertart Burgers. A mix of meats retained moisture and texture, but the seasoning (including Curtis' Buttertart BBQ Rub) was one that took the savoury and sweet combination a step too far. Disappointing as that was, it was further troublesome that the Buttertart BBQ Rub, and its related barbecue sauce, is required in a number of recipes in this chapter - after the experience of the burgers, these other dishes were unappealing. With well-shot food photography by Douglas Bradshaw, a number of solid dishes and featuring contributions from Martio Batali, Michael Smith and Ted Reader, Marty's World Famous Cookbook is as easy-to-like as its author. Straightforward and not particularly challenging, the book is suited to easygoing weekend cooking - or whenever you want to have a bit of a vacation in your own kitchen.